“Il Guerriero Errante.” Much more than a concept album, “Il Guerriero Errante” is a story told through progressive heavy metal music. The story’s protagonist is an ancient Longobardo-Sannita warrior and leader who demonstrated great bravery on the battlefield. The witch Janara has been ordered by the king to cast a spell on the warrior’s soul for having stolen the beloved Dame from his son, the prince. Through the spell, the Dame is destined to be re-born countless times to a life more miserable than the previous, and the warrior’s soul will spend eternity wandering the kingdom. The curse will be lifted only when the Dame remembers the love she once held for the Prince. 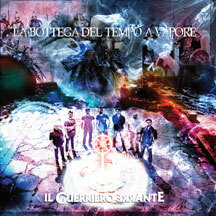 This partnership with Minotauro Records is an important milestone for “La Bottega del Tempo a Vapore,” and comes a mere five months since the self-release of “Il Guerriero Errante.” Self-produced, well-researched, and refined collectively by the band’s seven members, the album is deeply rooted in the progressive genre, with obvious nods to heavy metal, folk, and hard rock. The end result is an entirely unique album whose artful music helps to create lush imagery in the mind’s eye of the listener.